I’ve just reinstalled R60 in VirtualBox and somehow I can’t access to SmartDashboard anymore. I was able to access it before. 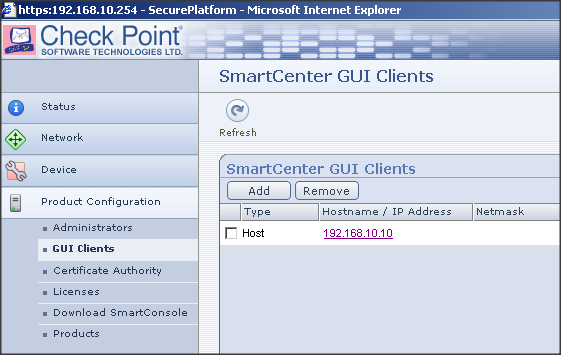 There is no network issue as I can ping from SmartDashboard to Management Server and vice versa. I’m able to access the web access and found the GUI client is defined correctly. Is there anything else I can do to fix this issue? It seems like I’m not the only one who experiencing with this problem. Quick search on google and found a few similar problems have been posted to The Check Point User Group forum, CPUG. Since I’m new to Check Point firewall and have no clue about what happened, I’ve decided to get help from them as well. Thanks to a senior member, ShadowPeak.com who responded to this issue quickly and has suggested a few ways to troubleshoot this issue which is totally new to me. I don’t have a chance to try all suggested method as once I’ve rebooted both SmartDashboard client and management server, I was able to login back. Hmm, weird. Btw, it’s good to know that this issue has been resolved by rebooting the servers.